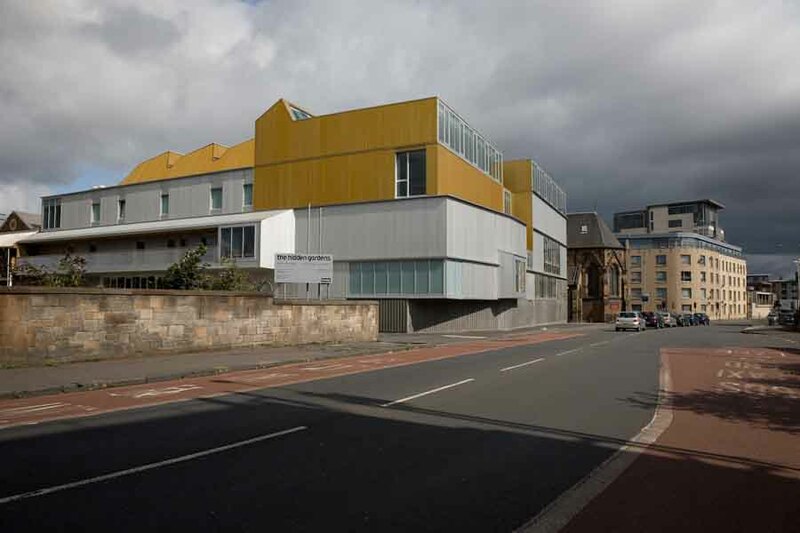 The new headquarters building for Scottish Ballet replaces a derelict section of the Tramway arts centre on the southside of Glasgow. 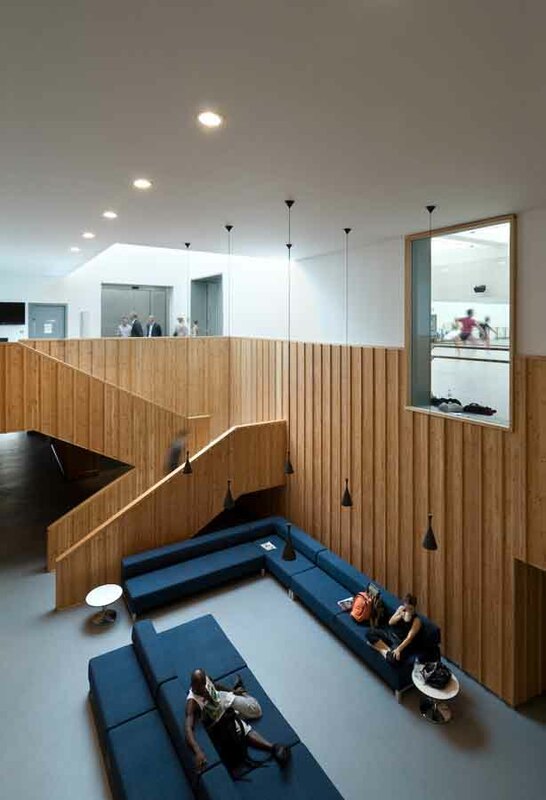 The brief for the Scottish Ballet building comprises three distinct areas – large technical workshops at ground floor, administration, wardrobe and music departments on the first floor, with three large rehearsal studios situated at the very top of the building. 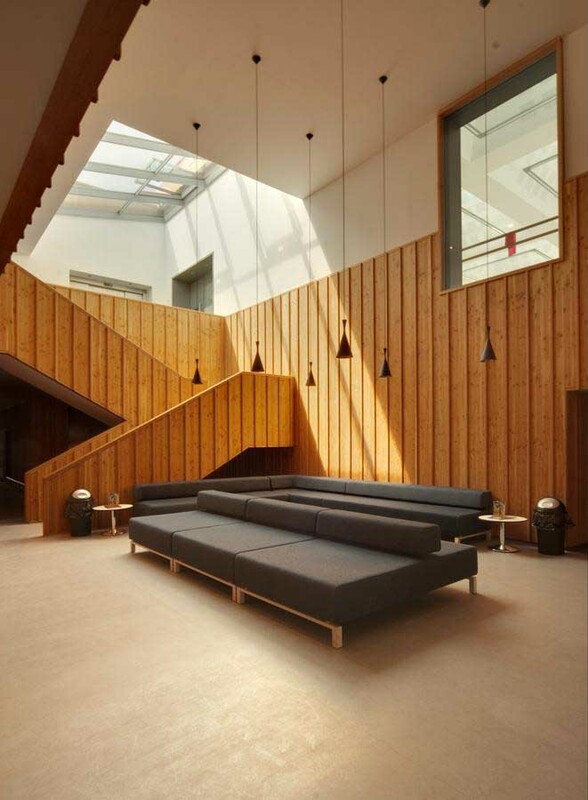 A large concrete stair connects Tramway’s existing foyer up to a new wood lined social space at the heart of Scottish Ballet’s building. 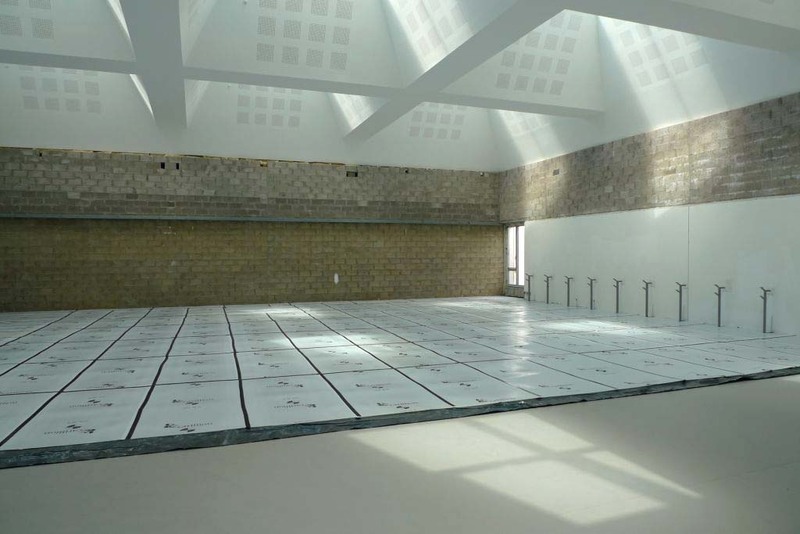 All the rehearsal studios have been designed as naturally ventilated spaces, reducing running costs and carbon emissions. 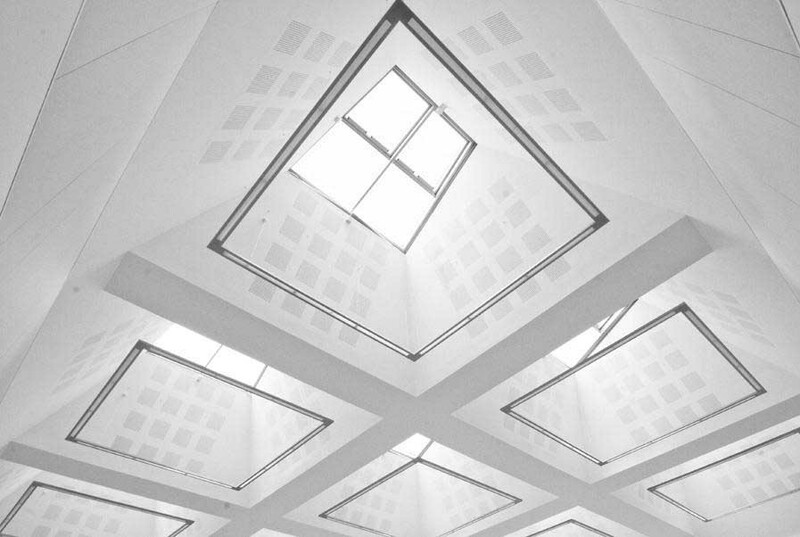 Studio one is located at the centre of the plan with nine truncated pyramid skylights, designed to maximize levels of natural light. 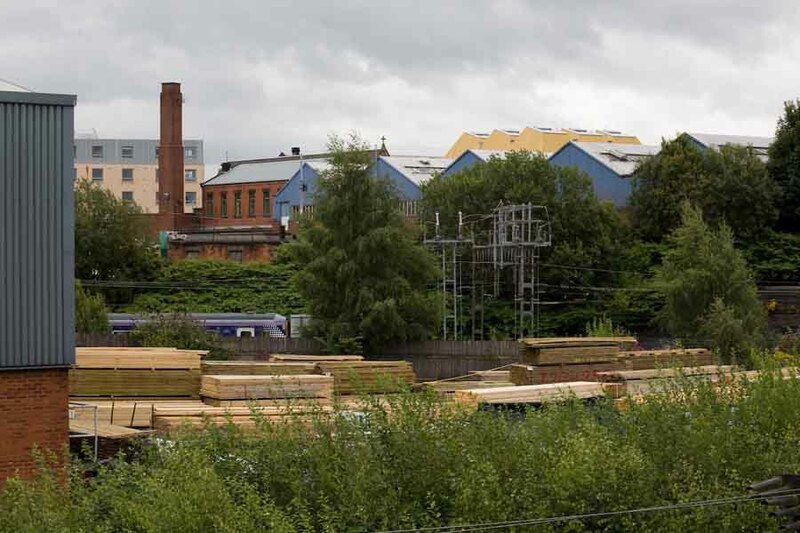 Studios two and three offer views onto Pollokshaws Road. 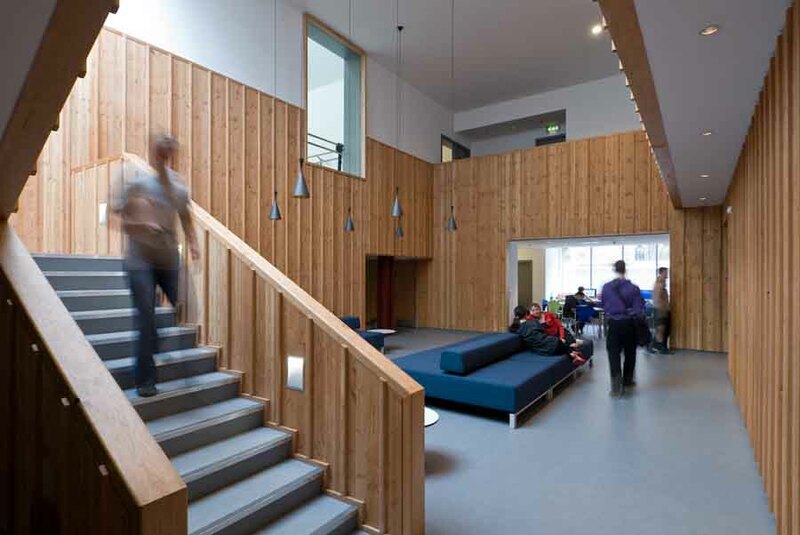 Externally, the Scottish Ballet building uses a textured, pigmented concrete cladding panel at ground level to cope with the robustness of the day-to-day life of the street. 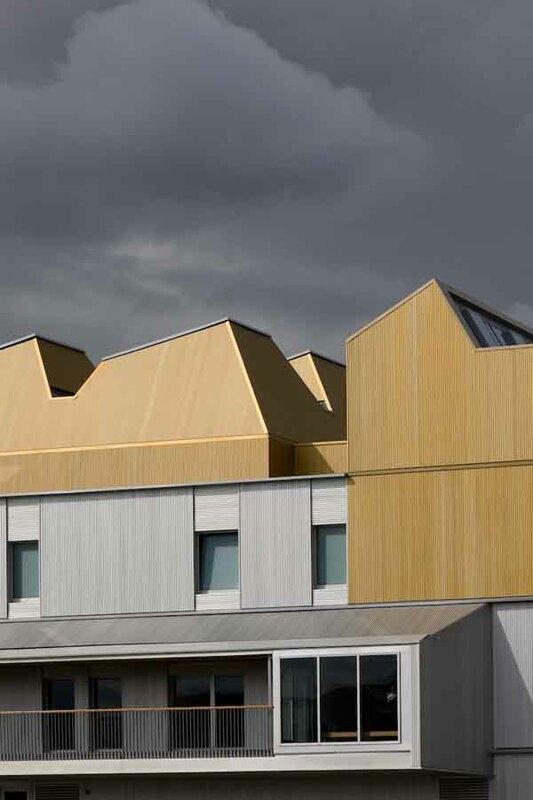 Above this, the building is clad in a profiled anodised aluminium sheet, which has varying profiles and colour, intended to achieve subtle layering that gives proportion and scale to the building. 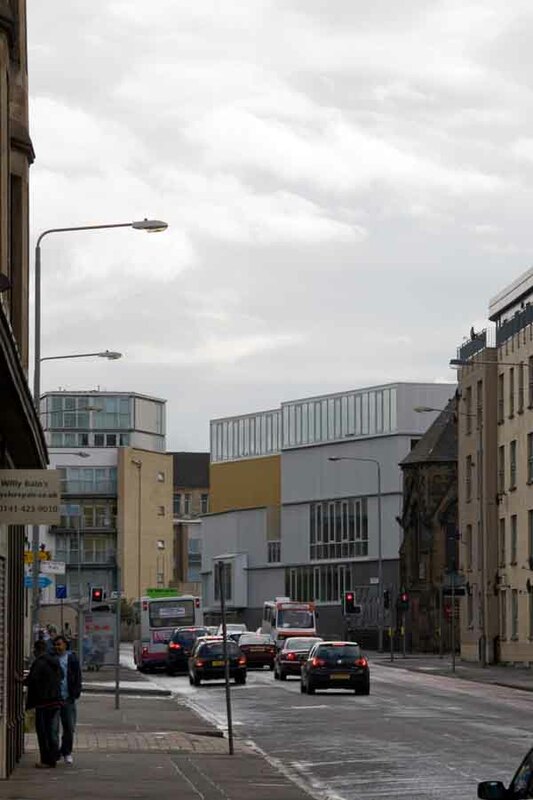 This new headquarters building for Scottish Ballet will comprise of rehearsal studios, technical workshops, wardrobe department and administration areas and will replace a derelict section of the Tramway arts centre located in the Pollokshields area of Glasgow. Large technical areas centred on a triple height scenic workshop are proposed at ground floor level. 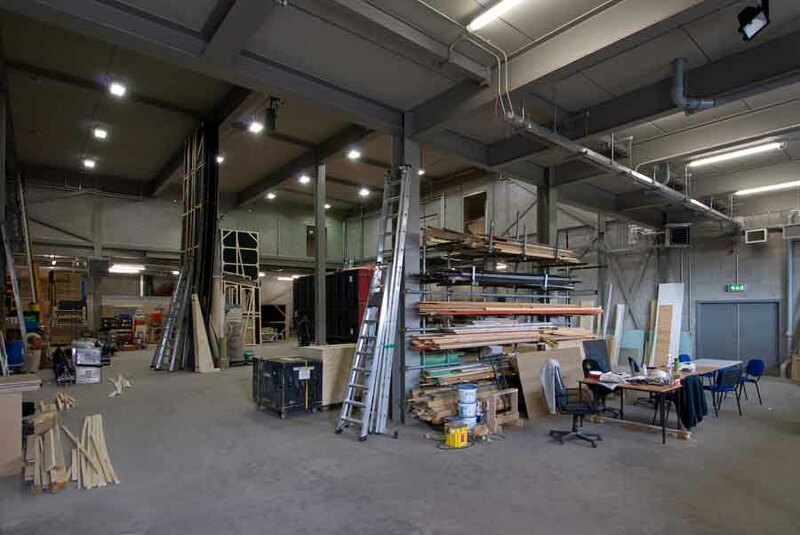 Administration and Wardrobe areas are organized around this huge space at first floor, with three large rehearsal studios at the top of the building. 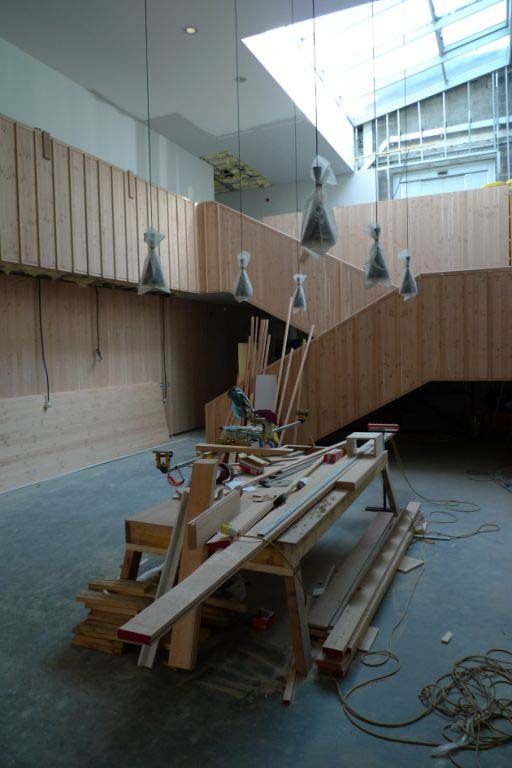 The route up into the new building from Tramway’s reception and social heart, ‘T3’ on Albert Drive, is articulated by daylight and terminates on a new internal court. This will be a focus for Scottish Ballet, and adjoins the green room (the social heart of the company). The court itself is double-height and lined with wood panels and has a large south-facing skylight. 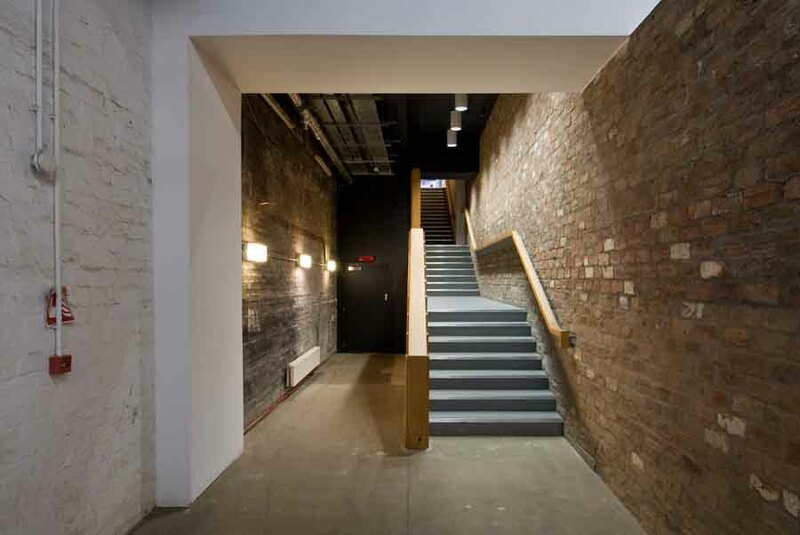 A broad stair leads up to the rehearsal spaces on the second floor, the milling areas of which are balconies overlooking it; while “back stairs” and lifts just off the court connect down to the workshops, as well as up to the studios. 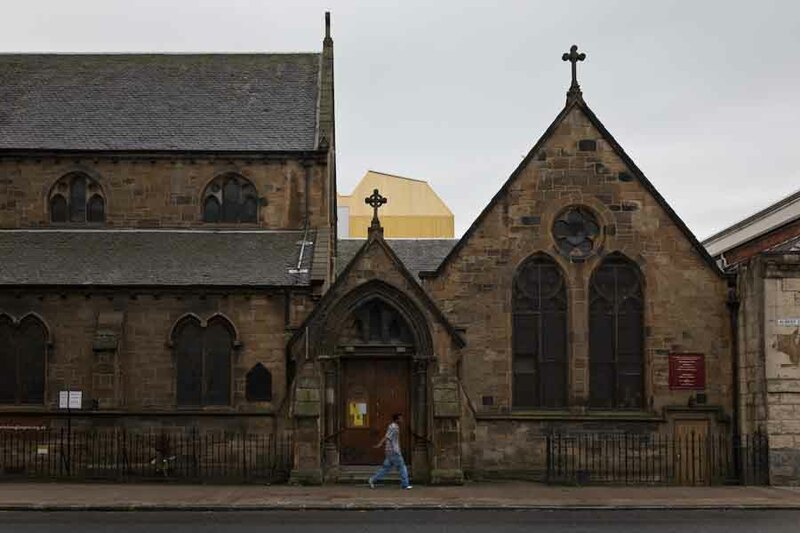 Two of the Scottish Ballet rehearsal spaces face onto Pollokshaws Road. These will have east facing clerestories balanced by west facing skylights and used as part of a natural cross ventilation strategy. 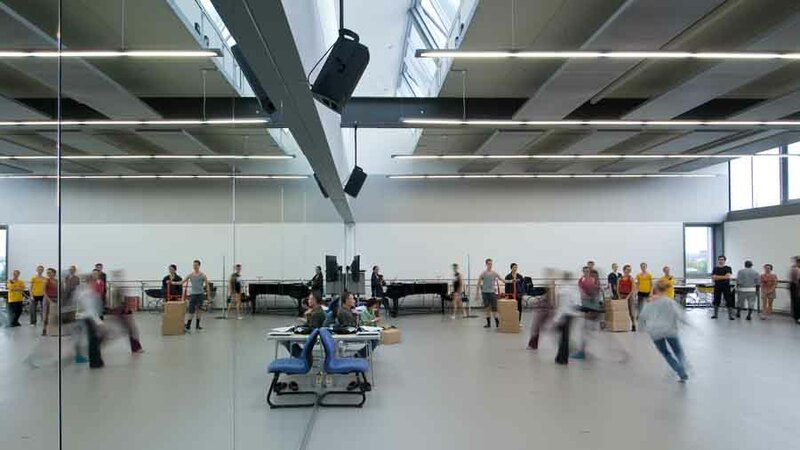 In contrast the principal rehearsal space – studio 1, is located at the centre of the plan. 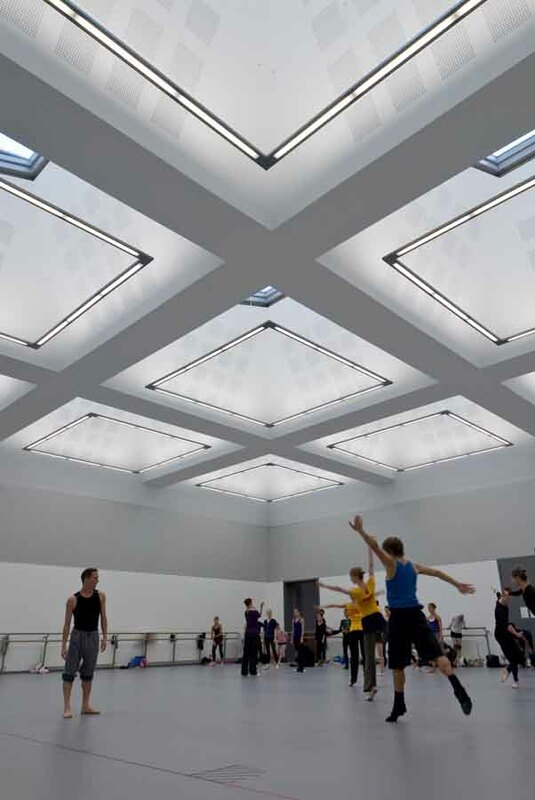 The structural grid is used to define nine huge skylights that will bring a diffuse, even light into the Scottish Ballet space. The engagement with the sky is discreet, with no distraction to the work within; nevertheless it is also designed to “lift” such activity, both literally and metaphorically. While the architecture of Scottish Ballet is at no times scenic, it attempts to express both the ‘artistry’ and ‘industry’ of the company. A picture window onto Pollokshields Road will display props from previous company productions; above this the wardrobe department has a large glazed wall, overlooking and animating the street and allowing glimpsed views of the elaborate costumes being made inside. The Studios above gain articulation by carefully positioned windows offering views up and down Pollokshaws Road and high clerestory windows; but it is not just the low level windows that animate; large mirrors along the edge of the ceiling to these studios, will allow pedestrians to look up and see reflected images of the dancers. 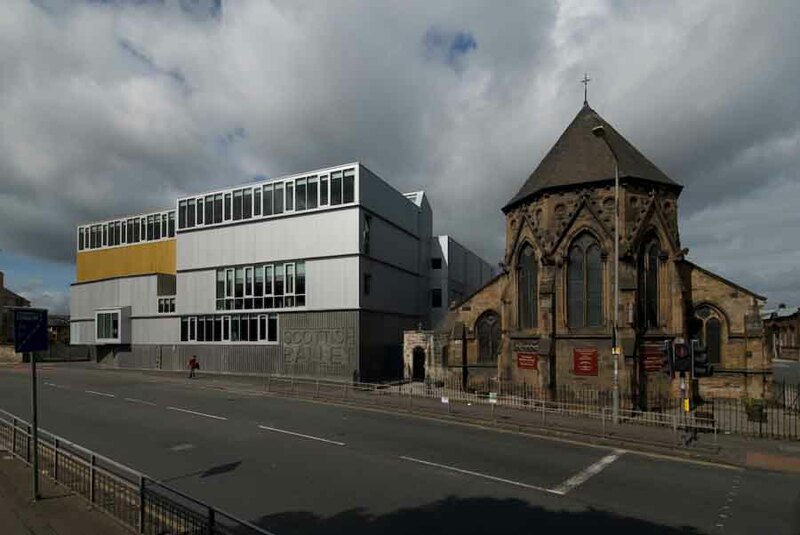 The massing of what is a large new building has been carefully considered in relation to its neighbours. 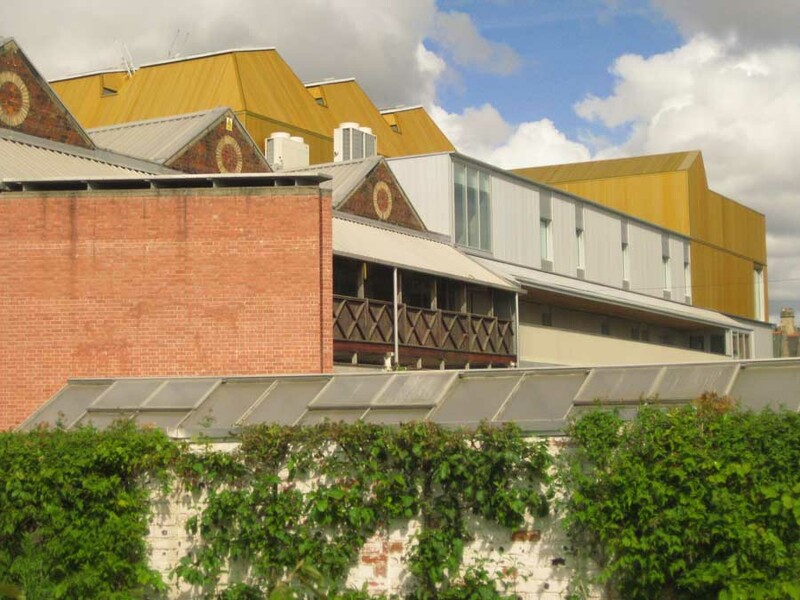 From the Hidden Garden the serrated skylights to Studio 1 provide an enjoyable culmination to the industrial roof profile of the existing Tramway building. The external Scottish Ballet elevations use a textured, pigmented concrete cladding panel at ground level, designed to deal with the robustness of the day-to-day life of the street. Above this, the remainder of the building will be clad in a profiled sheet aluminium which will have varying profiles and colour (from dark grey to silver and gold), all intended to achieve a subtle layering that will help to give proportion and scale to the building. Scottish Ballet moved into its current premises in 1979, a converted Territorial Army building. 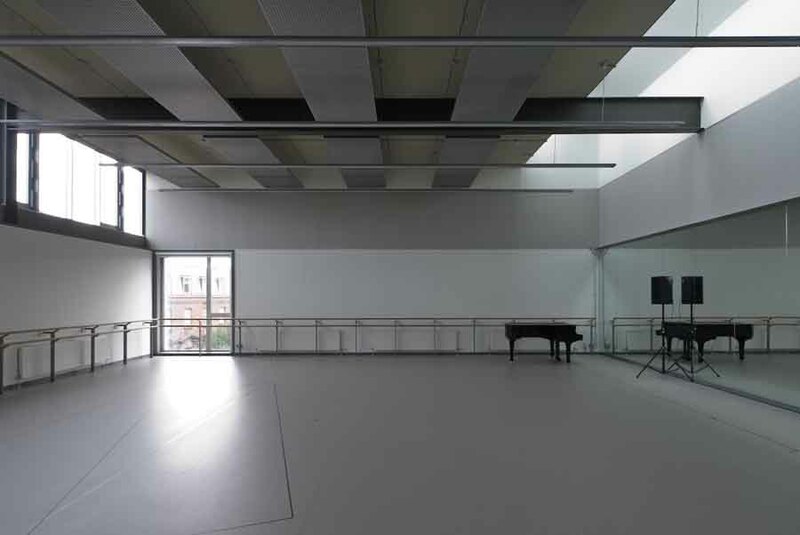 It has major space problems for a company of Scottish Ballet’s size and insufficient studio space. 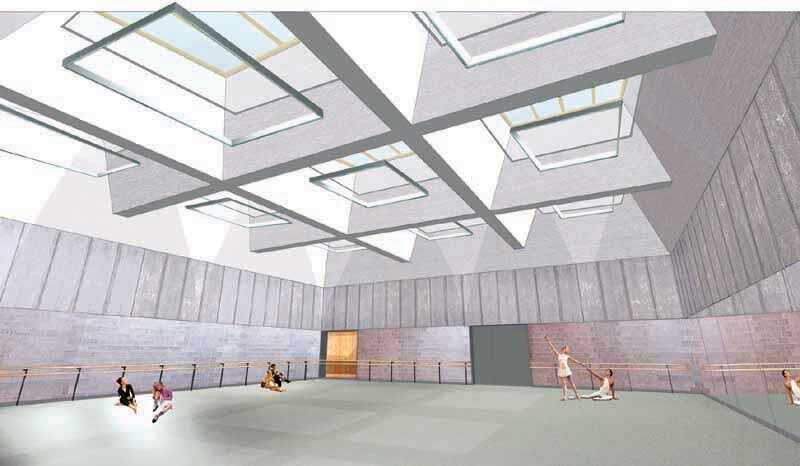 Scottish Ballet applied to the Scottish Arts Council Lottery Fund for help to develop plans for a state-of-the-art-dance centre, as part of the Tramway complex: this was successful. 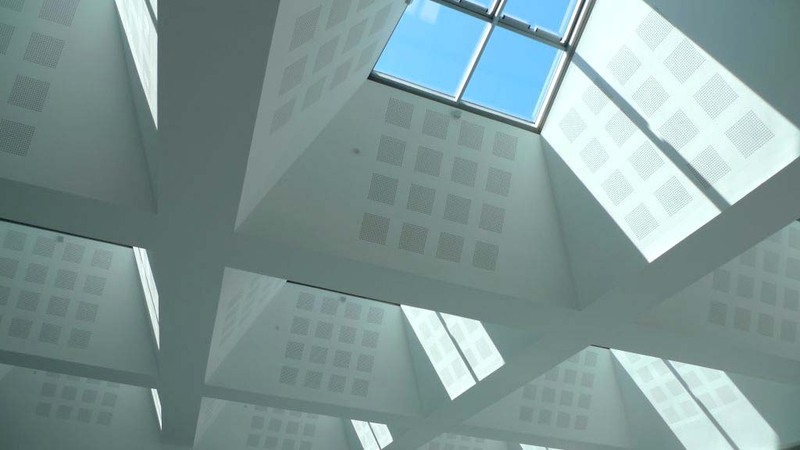 This project will place Scottish Ballet at the heart of a dynamic international performing and visual arts centre, thereby creating a production and presentation facility of a scale and artistic mix unrivalled in the UK. Tramway is owned and managed by Glasgow City Council. Brought back to life for Glasgow’s influential European Year of Culture in 1990, Tramway has gained an international reputation. 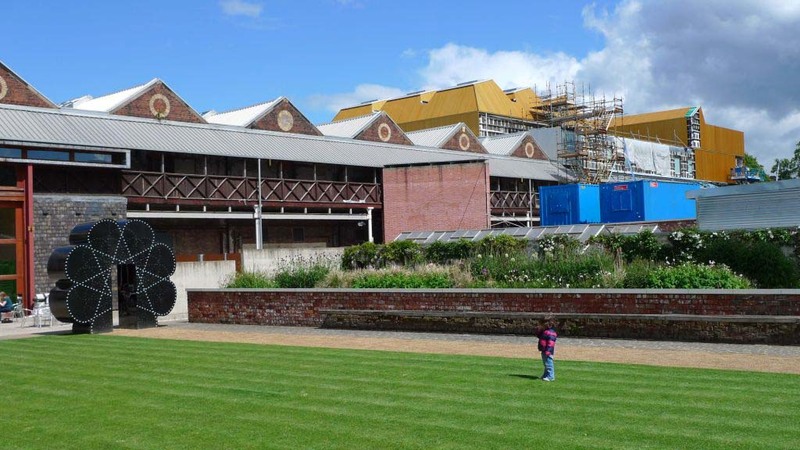 The project has developed significantly since initial plans in 2003 and Scottish Ballet now has a scheme that will enhance the Tramway without compromising the existing arts spaces. This plan will transform unused spaces at Tramway into studio, workshop, education and office spaces for Scottish Ballet and create the largest centre for dance in Scotland including much needed rehearsal spaces for independent professional dance artists and companies. This project will also benefit the local community with access and outreach programmes forming an integral part of Scottish Ballet’s move to Tramway. 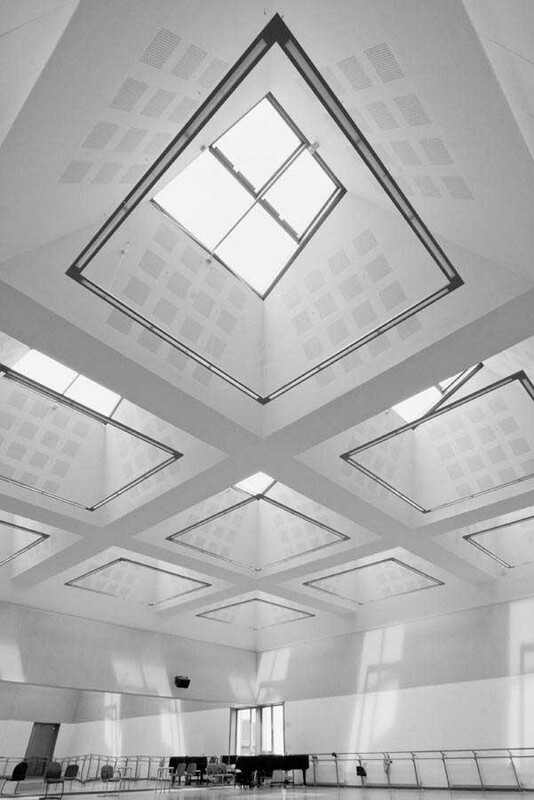 In 1997 Glasgow City Council ran an invited competition with four Glasgow architects. Phase One of the Tramway Theatre was completed in Jun 2000. 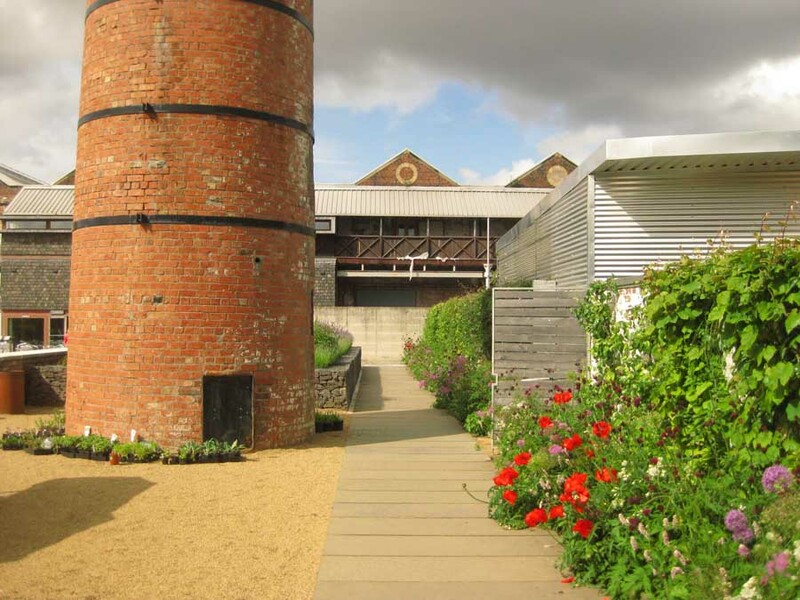 Phase Two – the Hidden Gardens project by NVA in the gardens behind the Tramway – opened in Jun 2003. The interior is really fresh and well articulated: the concept of leaving the textures of the old building was pretty novel and created much discussion when the Tramway opened. 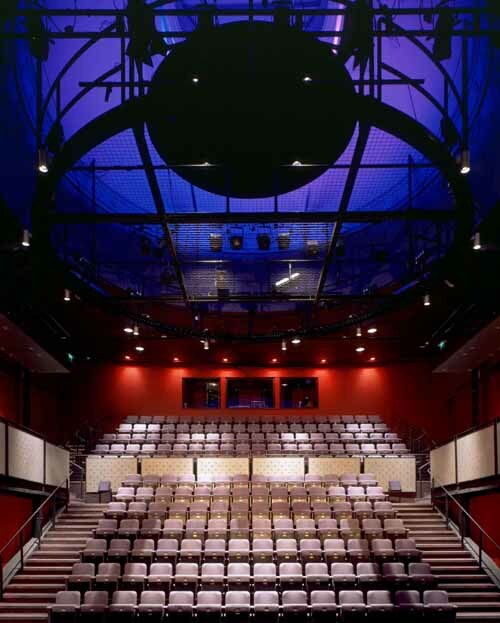 The Tramway Theatre won the Scottish Design Awards Architecture Grand Prix in 2000.